was placed on the National List of Historic Places in 1993.
school dances in that ballroom,” says one Valley resident. complementing the [Museum of Labor and Industry] across the street. Youngstown, Ohio, March 6th - Officials are now looking into what caused the fire that destroyed the nearly 100-year old ballroom at Idora Park in Youngstown. The investigation into who or what burned down one of Idora Park’s last standing structures continued on Tuesday. A fire engulfed the park’s ballroom around 10:00 a.m. Monday morning. The amusement building burnt to the ground before firefighters could extinguish the blaze. 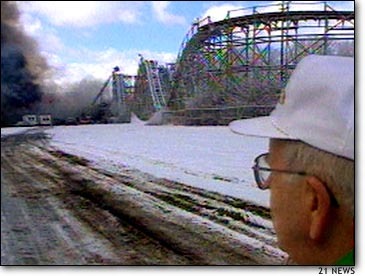 Besides extinguishing the flames, fire crews also fought to keep the fire from spreading to one of the park’s rollercoasters, the Jack Rabbit, which is located nearby. Monday’s blaze makes for the third fire at Idora Park in 15 years. Much of the park was destroyed by a fire in 1984. It was at that time that the ballroom first closed its doors. Since that time, the Youngstown Historical Society has been trying to save as much of the amusement park as possible, including the ballroom. The structure was placed on the National List of Historic Places in 1993. Mount Calvary Church is the current owner of the 26 acre property. A representative for the congregation says they are saddened by the loss of the ballroom.